The IMF has placed a road-block in the way of a deal with the Greek government and it remains unclear whether any agreement can be reached. The prior agreement which the IMF rejected was itself already very onerous. But the IMF wants to shift the burden of paying for the crisis away from taxes on business and the better-paid towards more cuts in social protection. This is an insupportable burden as net median household incomes are already below €8,000 a year. Many multi-member households without work subsist solely on state and public sector pensions. The IMF argues that taxes on business will hamper growth, as business profits are needed to fund investment. This argument is an important one and should be addressed. It can be demonstrated that it is false argument. In demonstrating that, it is also possible to identify a way out of the crisis. In general, in a commodity producing economy profits are the decisive factor in determining the rate of growth. In a capitalist economy it is the profits of the private sector which predominantly fund the accumulation of productive capital via investment. 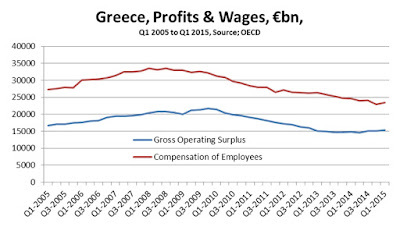 But if profits alone were sufficient, then there would no crisis at all in Greece. Greece has the highest profit share (profits as a proportion of national income) in the whole of the OECD. 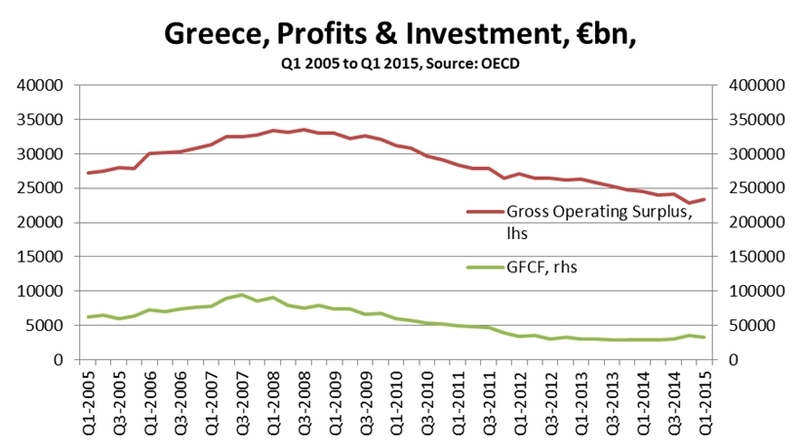 The Greek profit share was 52.4% in the most recent data. This is substantially greater than many other countries in the OECD and as a consequence the labour share of national income is also the lowest in the OECD. Table 1 below shows the profit share and the wage share in selected OECD countries. In effect, the IMF prescription is that those who are least able to pay should bear the burden of the crisis. Compensation of Employees as a proportion of GDP, data for Q1 2015. It should be noted that the crisis countries of the EU in general have the higher levels of profit share but Greece leads the pack. 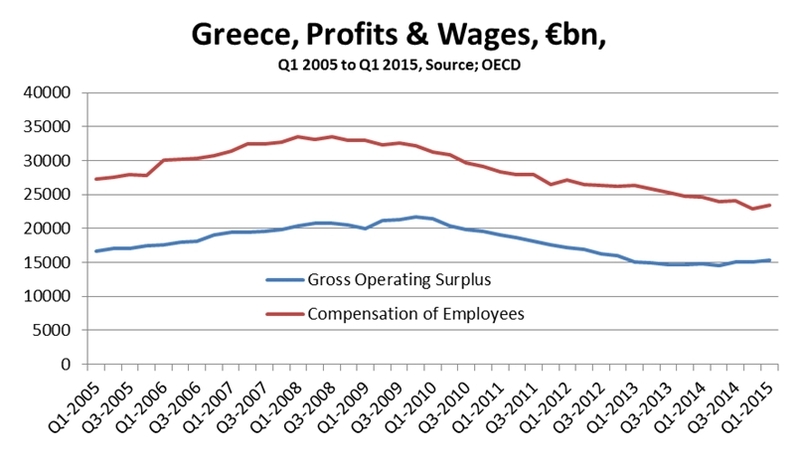 The trends in Greek profits and wages are shown in Fig. 1 below. There are already ample funds in Greece for productive investment in the form of the profit share of the business sector. The crucial point- and the driving force behind both the structural and cyclical crises of the Greek economy- is that Greek businesses are not investing, but are hoarding capital instead. Providing businesses with a shield against austerity while cutting social protection will not provide the investment needed. This is because Greek businesses are unwilling to invest. The level of profits in Greece and the level of investment (Gross Fixed Capital Formation, GFCF) are shown in Fig.2 below, as well as the gap between the two. In the most recent full year the nominal level of Greek profits was €95bn while the level of GFCF for the whole economy (including government and households) was just under €21bn. It is this level of uninvested profits which is the main cause of the crisis in Greece. Table 2 below compares the profit share and the rate of investment. Using OECD data it is also possible to show what proportion of that investment is actually made by the business sector itself. There are of course many other calls on the Gross Operating Surplus other than investment, such as taxes and social contributions, but in the case of Greece all these taken together amount to no more than 5.8% of national income. The net savings of the business sector are far larger, at 9.2% of national income, along with another 2.9% distributed to shareholders. In a certain sense the situation in Greece is just an extreme case of the general trend in the Western economies, where the profit share has been rising and yet the investment share has been falling. It is the extremely high level of uninvested profits which is the cause of the crisis. There is nothing to prevent the business sector investing all of its profits and more, via borrowing. This frequently occurs in economies where growth is strong. But in the OECD as a whole the business sector is hoarding capital. Greece is an extreme case because this has been the case over decades, and deteriorated further during the crisis. These savings are not being held in Greek banks, which is a factor contributing to their precarious state. Bank of Greece data show that deposits by Greek firms fell by €8bn (equivalent to 4.5% of GDP) in the year to April 2015 even though both profits and savings were substantial. This amounts to looting the country; extremely high rates of exploitation combined with minimal investment and spiriting away the resulting savings and shareholder dividends to overseas banks. It is precisely these idle resources of the business sector, especially the Greek oligarchs which should be tapped. This is not simply to shield workers and the poor from further austerity, as important as that is. But these idle resources could be deployed to fund an investment-led recovery that would regenerate the economy. It is precisely taxes and levies on the business sector which are required, and perhaps stronger measures such as nationalisation, in order to tap these resources. They are also the measures that provoke the fierce hostility of the international institutions led by the IMF. The argument that this will curb the investment of the business sector does not stand up. Despite claiming 52.4% of national income the business sector’s investment is equivalent to just 4.4%. The bulk of investment in the Greek economy comes from households, mainly on house building and repair. Business investment is just a fraction of the level of uninvested and profits and savings. 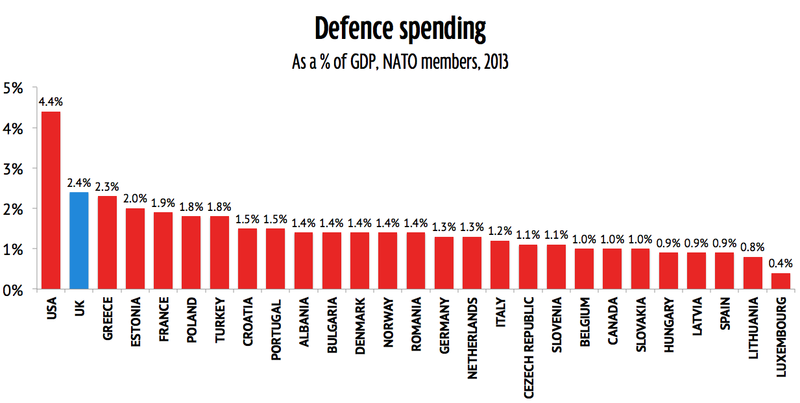 This remains the source of the Greek crisis, which cannot be resolved without state-led investment. Posted in: Earnings, Economy, Europe, International, Investment, Macroeconomics, Politics, Poverty/Low Pay, Public services, Public Spending. What’s a Greek earn theses days? Honestly the Greeks have brought this on their own heads, and its about time they admitted it, instead of blaming all and sundry. 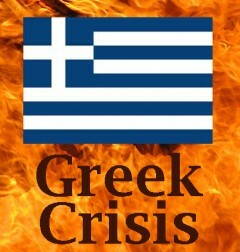 Grexit, in a few days time. Perhaps you could explain your position more clearly and tell us exactly how ordinary Greeks were responsible for the Banking crash. That of course can’t be blamed on the present government and they were elected against the austerity measures you appear to support. Yes swatantra, it’s a exactly like when all those greedy dinner ladies and zero hour contract workers on less than minimum wage caused the 2008 banking crisis isn’t it? Years and years of profligacy and paying themselves more than was necessary; more spent on Defence and other useless projects; entering the Euro when they just couldn’t support the extra burden ; refusal to accept a reasonable rise in pension age and other cuts imposed by the IMF. If this Greek Govt keeps wanting to postpone the inevitable, then this Greek Govt will have to go, and another Coalition put together in Parliament. Pointless putting it to a Referendum (aka the Irish) The MPs are going to have to shoulder the responsibility for the state they have led Greece into. Yes the EC Neo-Liberals don’t seem willing to accept an alernative perspective but of course are all hypocrites, bailing themselves out with what over a trillion of quantitative easing (but not allowing Greece into this policy tool) to buy off the financial crisis for a short while and the poor in Greece must be hammered more! Excellent piece in the latest New Left – Germany itself as the top dog is not as strong as it makes out, being sustained mainly by engineering exports to the likes of China and it is argued that Germany has broken Maistrict rules; it seems that rules like taxes are only for little people and little countries. Solidarity with Greece and return the Elgin Marbles!